1. 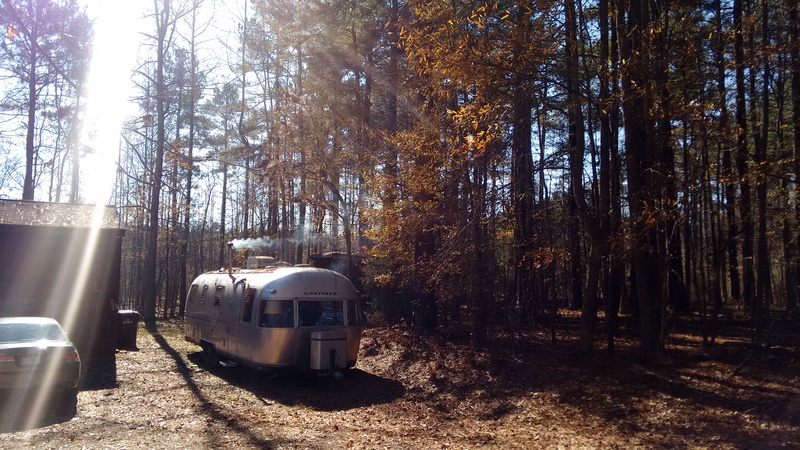 I installed a wood stove in my Airstream workshop (see the smoke in the photo above? Wood heat!) and its keeping me nice and warm this winter for just about zero cost since we live in the woods. Yep, that’s my workshop. I’ll update the gallery page soon with photos from the wood stove installation. I’m pretty pumped about it, because going on electric heat last year was both expensive and on the coldest days insufficient! Yes, I have a carbon monoxide detector, and since travel trailers like my workshop are naturally drafty (airtight trailer will kill you), my reading is steady at zero, so don’t worry about me! Just be glad I’m going to be warm this winter, unlike the last. 2. Stealth Mode continues! I am working through my waitlist (getting within shouting distance of the end finally!) and our impending house move this Spring is looming. Once we have the move behind us, I will be opening back up my waitlist. Most likely to past clients first. I will announce this here with a new News item, on Facebook, and on Twitter. I also don’t anticipate having any vintage horns for sale until then, either, but I do find it hard to say no when a nice clean vintage horn is offered to me for sale, so we’ll see. Oh, and as regards the move, we will be staying in the same general area, the rural parts of Orange County outside Durham, NC. Just not sure exactly where yet. We’d stay in this house, but our landlord is selling it. 3. Looks like I’ll be going to the 2015 Saxophone Symposium as long as the weather is alright. They’ve put it in Winchester VA this year, which as I understand it is a bit mountainous and can get snowy. I hope to see you there. 4. We have a daughter! Our second child was born this past summer. She is happy and healthy, and I am genuinely touched by the number of you who made a point to congratulate me when you called up for sax stuff. Thank you! 5. My complementary website www.OpenSourceSaxophoneProject.com is still in my thoughts, and I might even do a kickstarter/crowdfunding type of thing at some point next year to see if you guys would like to help me take a month off regular paying work so I can spend that solid chunk of time churning out dozens of videos and articles for my youtube page and for the Project. Not sure yet, but I might! Either way, I will continue making videos and writing articles. I’m in this for the long haul! And I think that’s it for now. Just a few more months of craziness until I’m settled in our new place, whatever that might be. I can’t wait to be moved already!